Season fish with salt and pepper. Cook by your favorite method until it appears opaque and flakes apart easily (see Notes). 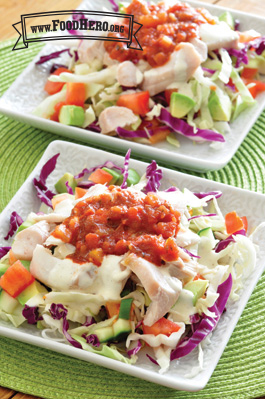 Mix cabbage or lettuce with other vegetables of your choice. Add chunks of fish. Drizzle with ranch dressing and salsa. In a Skillet - Spray or lightly oil a skillet. Add seasoned fish and cook over medium heat (300 degrees in an electric skillet) until flesh starts to appear white. Turn fish over and cook until it flakes easily. In the Oven - Put seasoned fish in a baking pan and cover with foil. Bake in a 350 degree oven until fish flakes. Under a Broiler - Place seasoned fish on a broiler pan. Broil several inches from the heat until the fish is opaque throughout and flakes easily. To make tacos instead of salad: Warm tortillas. Layer cabbage or lettuce, vegetables of your choice, and fish on the tortilla. Drizzle with ranch dressing and salsa. Fold in half.